What is Aspirin? How Aspirin was made? Aspirin is a Brand name for a medicine that contains acetyl salicylic acid as an active ingredient. This drug reduces substances in the body that cause pain, fever, and inflammation. It is used as a mild pain and fever reliever. Aspirin also inhibits platelet aggregation and is used in the prevention of arterial and venous thrombosis. This medicine is often prescribed in order to prevent and treat conditions after heart attacks, to prevent strokes, and to treat arthritis or inflammation. Aspirin is available in an over-the-counter (OTC) and prescription form, with variety of brand names, but it can be also found in many combination products. This drug is available in different forms, including: tablet, film coated tablet, chewing-gum, Rectal suppository or chewable tablet. It is available in doses of 81 mg, 325 mg and 500 mg.
Aspirin is the first synthetic substance made in 1853, by chemist Charles Frédéric Gerhardt who treated sodium salicylate from willow tree leaves with acetyl chloride to produce acetylsalicylic acid for the first time. Before that salicylic acid has been used for centuries in the form of leaves from the willow tree, due to its health benefits. In 1897, scientists at Bayer University started studying acetylsalicylic acid as a more efficient, safer and less-irritating replacement for common salicylic acid medicines. By 1899, Bayer had named the drug Aspirin and was selling it around the world. Aspirin was Bayer’s brand name; however, Bayer’s rights to the trademark were lost or sold in many countries. FDA approved Bayer Aspirin in 1965. What is Plavix? What is Plavix used for? Plavix is a Brand name for a medicine that contains clopidogrel as an active ingredient. This drug prevents platelets from sticking together in the blood and forming a blood clot that can occur with certain heart or blood vessel conditions. Plavix is often prescribed due to following a heart attack or stroke. Plavix is also used to treat and prevent attacks of unstable angina pectoris or peripheral artery disease. Using Plavix in combination with aspirin is effective in preventing another heart attack, but this combination may increase your risk of bleeding. It is also known that clopidogrel is associated with rare but serious side drug reactions including severe neutropenia, hemorrhage and cardiovascular edema. Your doctor will decide initial Plavix dose based on your condition. The maintenance dose is 75 mg taken by mouth one time per day. Plavix is available in the form of tablet and film coated tablets in doses of 75 mg and 300 mg. FDA approved clopidogrel in 1997. It is originally manufactured by Bristol-Myers Squibb and Sanofi. The platelet aggregation-inhibiting effect of Aspirin specifically involves its ability to work as an acetyl donor to enzyme cyclooxygenase – COX. However, non-acetylated salicylates have no clinically significant effect on platelet aggregation. Irreversible acetylation of cyclooxygenase renders this enzyme inactive, preventing the formation of the aggregating molecule thromboxane A2 in platelets. Since platelets got no the ability to synthesize new proteins, anti-aggregative effects remains for the life of the exposed platelets which is about 7-10 days. Acetylsalicylic acid may also inhibit production of prostacyclin (PGI2), which is the platelet aggregation inhibitor, in blood vessel endothelial cells; but, inhibition of prostacyclin is not permanent, because endothelial cells can produce more cyclooxygenase to replace the non-functional enzyme. Clopidogrel is a prodrug, so it must be metabolized by CYP450 enzymes in tehe liver to produce the active metabolite that than inhibits platelet aggregation. Clopidogrel’s active metabolite prevents binding of ADP – adenosine diphosphate to platelet receptor sites, thus impairing the ADP-mediated activation of the glycoprotein GPIIb/IIIa complex which is necessary for platelet aggregation. It is suggested that this inhibition induce a mobilization blockade from the storage sites of the platelet granules to the outer membrane. Clopidogrel irreversibly and specifically inhibits the P2Y12 subtype of ADP receptor, important in plateletsaggregation and cross-linking by the protein fibrin. As the glycoprotein GPIIb/IIIa complex is fibrinogen’s major receptor its impaired function prevents fibrinogen actions and inhibits platelet aggregation. Aspirin and Plavix have many differences but their biggest similarity is their property to inhibit platelet aggregation in the body. Chemically these drugs are different. Aspirin is derivative of benzoic acid and belongs to the class of phenol esters. Clopidogrel from Plavix belongs to the class of organic compounds known as alpha amino acid esters. The other difference is in their mechanism of action. Aspirin works by inhibiting COX enzyme, while clopidogrel works by impairing the ADP-mediated activation of the glycoprotein GPIIb/IIIa. Compared to aspirin, Plavix is also prescribed as secondary prevention of atherosclerotic events in patients with a history of stroke, myocardial infarction, peripheral vascular disease and in those at high risk of vascular events who have major contraindications to aspirin. However, in most those cases, aspirin is first line therapy while Plavix is a second line. Plavix can be also prescribed for post off-pump CABG (beating-heart surgery) and post coronary artery stenting but only on temporarily basis. The FDA has not approved Plavix for the treatment of atrial fibrillation arrhythmias, while aspirin has been approved. However, many studies showed that clopidogrel has almost the same or even better efficacy compared for same aspirin indications. When patients who could not tolerate aspirin are switched to Plavix, they probably assumed that the risk of Plavix side effects would be almost similar to, if not less than, comparable with aspirin. Even with a higher risk of Plavix to cause stomach bleeding, they would have assumed that Plavix was as effective as aspirin with similar safety. Absorption after aspirin oral administration is generally rapid and complete but may vary depending on dosage form, tablet dissolution rate and gastric or intraluminal pH. Absorption of clopidogrel is at least 50% based on urinary excretion of its metabolites. Bioavailability of clopidogrel is not affected by food. Both drugs have excessive potential for protein binding with a range of 98-99.5 %. Protein binding will be decreased in situations when plasma salicylate concentration increases, during reduced plasma albumin concentrations, renal dysfunction, and during pregnancy. Aspirin is rapidly metabolized via hydrolysis primarily in the liver to salicylic acid, which is then conjugated with glycine forming salicyluric acid and glucuronic acid which are largely excreted in the urine. Clopidogrel also has hepatic metabolism which is extensive and rapid. It is a prodrug form of drug which is hydrolyzed to carboxylic acid derivative, the main circulating metabolite, which accounts for approximately 85% of the circulating drug-related compounds. A glucuronic acid derivative has been also found in plasma and urine. Metabolites do not have platelet inhibiting effect. Aspirin elimination half-life time is approximately 15 minutes, as the dose increases from 300 to 650 mg half-life increases to 3.1 to 3.2 hours. Clopidogrel elimination half-life time is about 8 hours. Which drug is more effective according to studies, Apirin or Plavix? CAPRIE trial (The Clopidogrel versus Aspirin in Patients at Risk of Ischemic Events) compared 75 mg of clopidogrel to 325 mg of aspirin in about 19,000 patients with symptomatic vascular disease, with recent ischemic stroke that happened in a time between1 week to 6 months, and myocardial infarction within 35 days or documented peripheral arterial disease. Clopidogrel was associated with a significant 8.7% relative risk reduction among all patients and compared with aspirin for the primary end point of ischemic stroke, myocardial infarction, or vascular death (5.32% risk after clopidogrel use compared with 5.83% risk after aspirin use per year). The benefit of clopidogrel against aspirin was best achieved in patients with peripheral arterial disease (3.71% risk after clopidogrel use vs 4.86% risk after aspirin use per year. Trial also found that the benefit after clopidogrel use was not statistically significant in comparison with aspirin (7.15% risk after clopidogrel vs 7.71% risk after aspirin use per year). Risks of causing hemorrhage were similar between the groups. Overall relative benefit of clopidogrel over aspirin according to CAPRIE trial was modest with absolute risk reduction of 0.5% per year. Combination therapy of aspirin + clopidogrel has been shown to be more effective than aspirin or clopidogrel monotherapy in patients with acute myocardial infarction, unstable angina, or coronary interventions. This combinationt is used commonly, especially for patients with coronary artery disease. One study of aspirin has been shown 23% risk reduction for recurrent nonfatal stroke compared with placebo, and has determined aspirin as antiplatelet medication for stroke prevention. 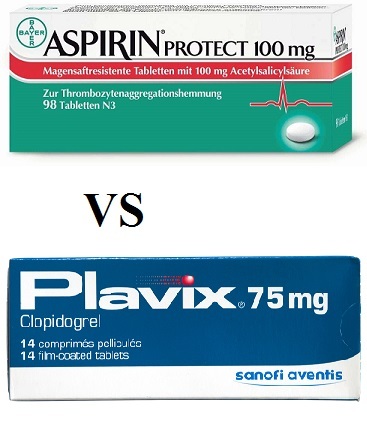 Which one is expensive, Aspirin or Plavix? Prices depend on the pharmacy you visit. Prices are for cash paying customers only and are not valid with insurance plans. Before taking aspirin, you should tell tour doctor if you have or have ever had: Asthma, uncommonly frequent stuffed or runny nose, nasal polyps, frequent heartburn, upset stomach, or stomach pain, ulcers, anemia, gout, diabetes some liver or kidney disease, hemophilia or any other bleeding conditions. You should talk to your doctor before giving aspirin to a child or teenager under 16 years. The medicine can cause a serious and sometimes fatal condition known as Reye’s syndrome if it given to a child recovering from chickenpox or flu-like symptoms. Before having any type of surgery, including dental procedures tell your doctor you are taking aspirin. You should not take aspirin for pain treatment during a period longer of 10 days or to treat a fever that lasts longer than three days, because such symptoms may be a signal for more serious condition. If you take aspirin on constant basis to prevent a heart attack or stroke, you shouldn’t take ibuprofen or other non-steroidal anti-inflammatory drugs such as naproxen or diclofenac to treat pain without consulting your doctor first. Aspirin may cause stomach or intestinal bleeding and ulcers. Older adults may be more sensitive to aspirin side effects. Talk to your doctor about any allergies you might have after taking medicines like prasugrel (Effient), ticlopidine (Ticlid) or ticagrelor (Brilinta) so that doctor can be sure that Plavix is safe to be taken. Patients should also tell their doctor if you ever have a history of stroke, including mini-strokes known as transitory ischemic attacks, ulcerative colitis, stomach ulcers and kidney disease.